MessyJesse - a quilt blog by Jessie Fincham: Inside Crochet Magazine Feature! I'm so excited to be featured in this month's Inside Crochet magazine! 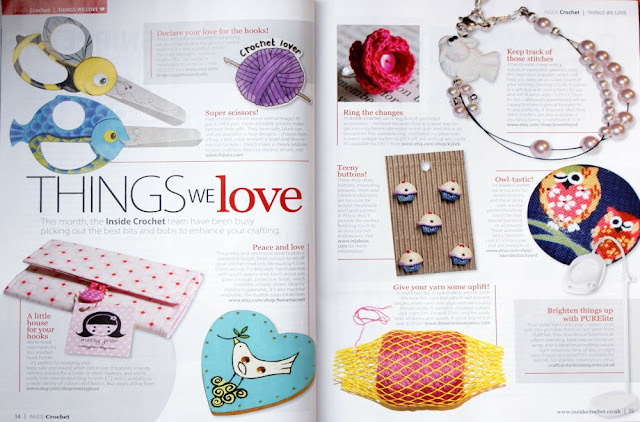 They have very kindly featured one of my crochet hook organisers in the 'things we love' section. It's such a fantastic magazine for crocheters and I noticed they are doing a great job in supporting us Etsy sellers, as I spyed lot's of other Etsy products throughout the magazine. I really can't believe how lucky I am sometimes, it just amazes me that people are so kind about my Messy Jesse products. It reads: "A little house for your hooks. We're head over heels for this crochet-hook holder - it's perfect for keeping your tools safe and sound when not in use. It features a handy notions pocket for scissors or stitch markers, and will fit easily into your project bag. It costs £12 and is available in a wide variety of colours and fabrics." and It's available to buy online now! congrats Jesse!!! that is so fantastic! wow, how exciting! what a boost for your etsy shop! congrats! Congratulations!!! You'll soon become famous at Canary Island too. Glad to know this.. Crochet Magazines provide a fun way to discover new crochet patterns and designers. Whether in print or online, magazines offer a collection of patterns, tutorials and information that are helpful to any crocheter.